Band-rumped Storm-petrel - Gulf stream waters, SE of Hatteras Inlet, North Carolina - May 26th, 2011. 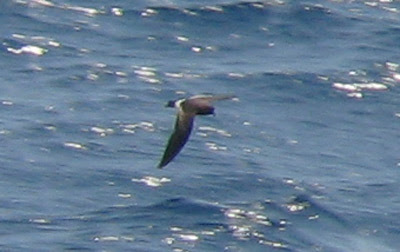 Flight style often compared to a small shearwater and somewhat evident in this shot. Overall quite warm brown, not so black-brown as Wilson's Storm-petrel. Digi-bin shot, along with all the other images in this post, taken using Canon Powershot A560 and Leica 8 x 42 binoculars. *NB. There are still some spaces available on the forthcoming BBC Extreme Pelagic departing from Hyannis, MA at 4am on Saturday July 16th, 2011. The trip will target core eddies of warm water at the edge of the Continental Shelf which may attract rare species typically associated with the Gulf Stream. 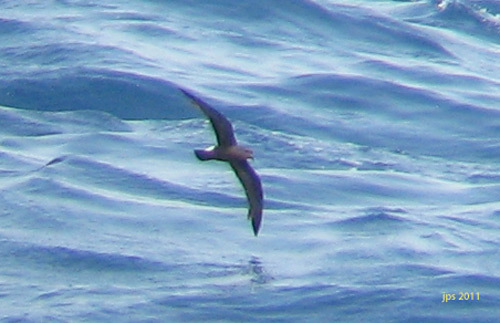 Band-rumped Storm-petrels will be high on the list of possible species, along with Audubon's Shearwaters, Bridled Terns and perhaps White-faced Storm-petrels. 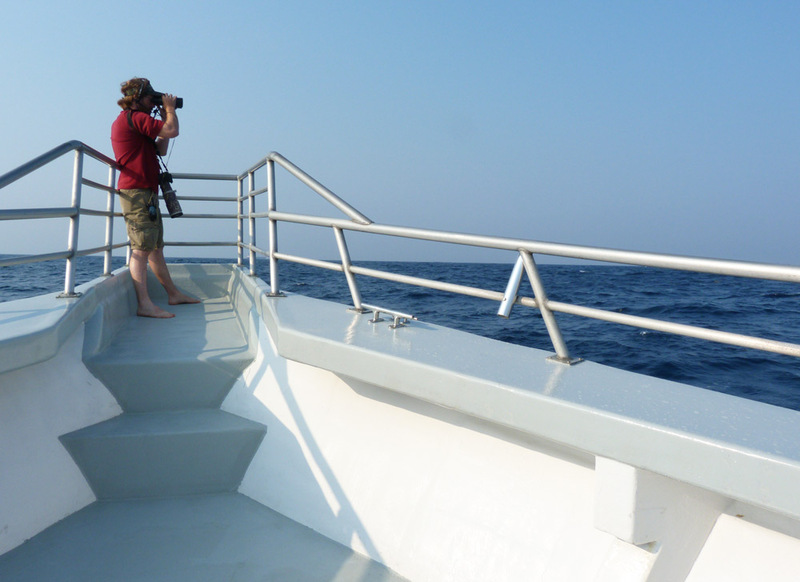 Rarities are being detected with increasing frequency on these trips and a rare pterodroma, such as the Black-capped Petrel we found July 2009, will be high on the 'wish list' for many. Yet another dedicated offshore pelagic with the Brookline Bird Club is fast approaching, departing on Saturday July 16th. It seems like as good a time as any for a quick review of the Band-rumped Storm-petrels images I collected in North Carolina in late May. 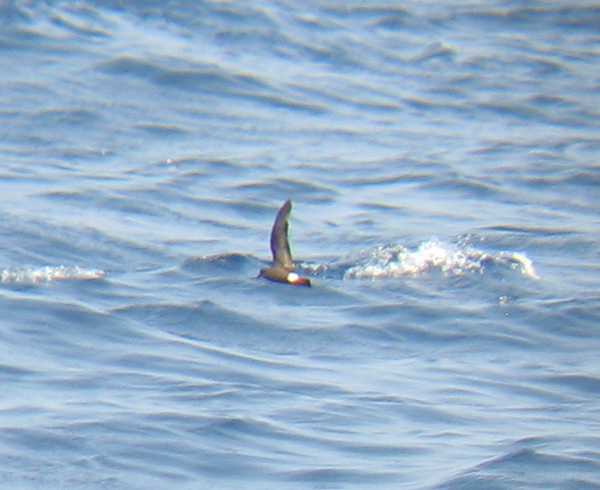 Aside from Black-capped Petrels and the reasonable possibility of rarities, one of the species that I really hoped to see well on the North Carolina pelagics was Band-rumped Storm-petrel. My previous experience of Band-rumpeds was limited to just a handful of individuals seen rather fleetingly on the BBC extreme pelagics. 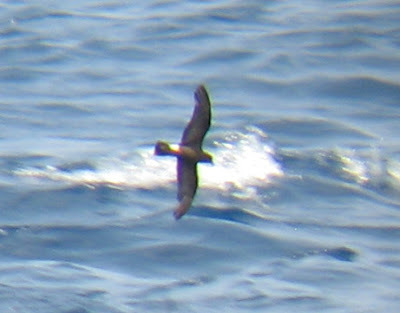 Two days of pelagics off Cape Hatteras on May 25th and 26th produced about half a dozen Band-rumpeds on each day. They were often shy, rarely coming close to the boat and usually passed through the chum-slick without really hanging around (unlike the many tens of Wilson's Storm-petrels). It did, however, provide the opportunity I was looking for to get a firmer grasp of key identification features compared to Wilson's and Leach's Storm-petrels. My level of comfort increased with each and every observation and, once again, I was reminded that there is absolutely no substitute for field experience! The photographers on board spoke of this species as being notoriously difficult to capture in images, something with which I'd agree. Even so, despite the distance and speed with which these birds worked around the boat, I was quite happy to come away with a handful of digi-bin images. 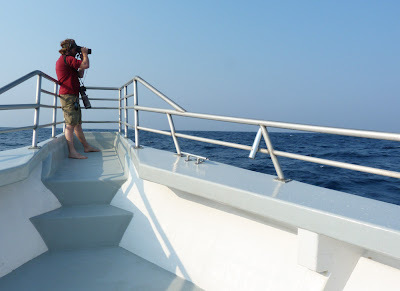 Impressively, the crew of the Stormy Petrel II worked really hard to ensure that everyone on board had acceptable views of Band-rumped Storm-petrels. Thanks to Brian and his crew for announcing every individual bird! Band-rumped Storm-petrel - Gulf stream waters, SE of Hatteras Inlet, North Carolina - May 25th, 2011. This bird shows a chunky impression, with fairly 'muted' carpal bars and a fairly long, broad 'arm' compared to Wilson's SP. The tail of this bird is also slightly notched. Band-rumped Storm-petrel - Gulf stream waters, SE of Hatteras Inlet, North Carolina - May 25th, 2011. This bird shows similar features to the bird above, with dull, sullied carpal bars and looking rather long-winged and heavy-billed, and with a narrow band of white across the rump. Band-rumped Storm-petrel - Gulf stream waters, SE of Hatteras Inlet, North Carolina - May 25th, 2011. 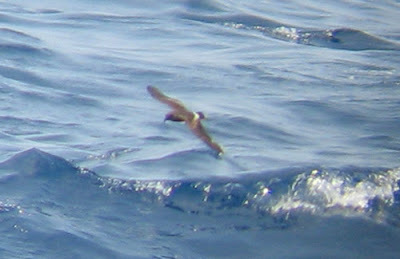 Band-rumped Storm-petrel - Gulf stream waters, off Hatteras Inlet, North Carolina - May 25th, 2011. Again, hinting at the shearwater-like flight style, this bird showing obvious signs of primary molt. 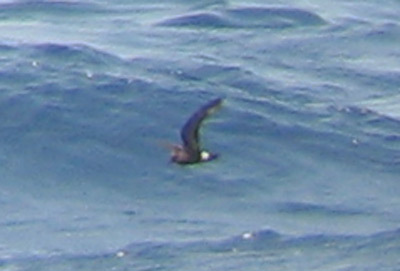 Band-rumped Storm-petrel - Gulf stream waters, off Hatteras Inlet, North Carolina - May 25th, 2011. 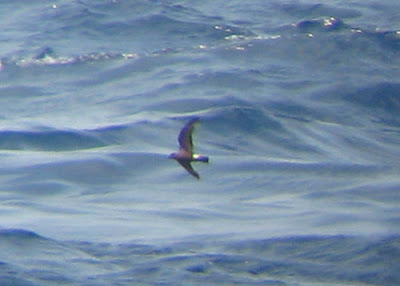 Always looking longer winged and warmer brown compared to the many Wilson's Storm-petrels present. Band-rumped Storm-petrel (lower right) - Gulf stream waters, SE of Hatteras Inlet, North Carolina - May 25th, 2011. 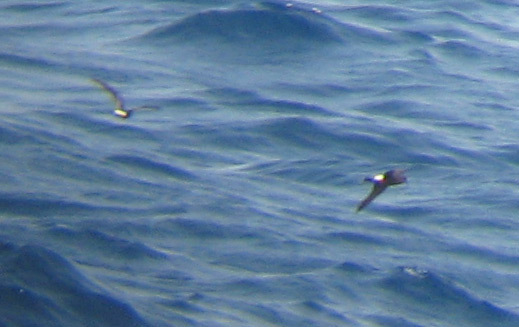 With Wilson's Storm-petrel (upper left). 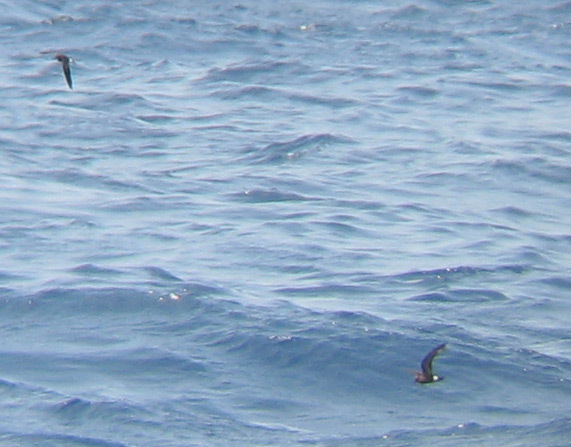 Band-rumped Storm-petrel (upper left) - Gulf stream waters, SE of Hatteras Inlet, North Carolina - May 25th, 2011. With Wilson's Storm-petrel (lower right). Even on this poor shot, the Band-rumped SP looks larger, browner and longer-winged than the small, blackish-brown Wilson's SP. Bob Fogg - hard at work on the bow of the Stormy Petrell II, one of Brian Patteson's very capable team of leaders. Gulf stream waters, SE of Hatteras Inlet, North Carolina - May 25th, 2011. Little Egret - Scarborough Marsh, ME. June 30th, 2011. First state record found by Doug Hitchcox on June 29th, 2011 - an ABA Code 4 species. 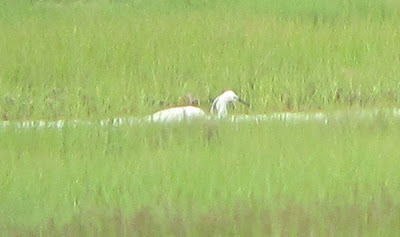 Views off the Eastern Road Trail proved to be distant at all times, but the extra-ordinary nape plumes, in combination with greenish-gray lores and straight black bill provided relatively 'easy' separation from the neighboring Snow Egrets. Kudos to Doug for his excellent bird finding and obvious knowledge of the key identification features for separating these two very similar species. On June 29th Steve Mirick forwarded a message from the Maine list-serve describing a Little Egret that Doug Hitchcox had found and photographed at Scarborough Marsh just south of Portland. I already had fond memories of this marsh, a spot which had hosted another 'mega' in the form of a European Golden Plover, which Susannah, Matan and I traveled to see on October 11th, 2008. Having lived in New England since 2003, I couldn't recall hearing of a solid report of a Little Egret in any of the New England states in recent years, though I was aware of two historical records for Massachusetts (1989 & 1992). It wouldn't be an exaggeration to say that I've seen many tens of thousands of Little Egrets in the Old World, mostly in Israel but also on my travels in Europe, Asia and Africa. But I'd never come across one in North America, or had the opportunity to chase one so close to home! With no further reports through the early morning of June 30th, but with the knowledge that the bird had been seen for most of the 29th, I decided to take my chances and set off from Gill in mid-morning. Wrestling with holiday traffic heading into New Hampshire and Maine was no fun and I arrived at the scene much later than I wanted to at 1:30pm. Luckily, the first birder I spoke to had just seen the egret and I walked along the trail to join Steve Grinley and Margo Goetschkes, remarkably the only birders present at the time. A few other birders came and went but I was surprised not to see more people at the scene. 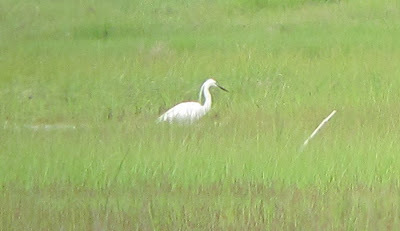 The Little Egret was in view, albeit distantly, throughout the 75 minutes that I spent at Scarborough Marsh, at times feeding alongside Snowy Egrets, Little Blue Heron and Glossy Ibis. Aside from myriads of tiny black biting flies, the marshes were full of the sounds of Eastern Willets, Bobolinks, and both sharp-tailed sparrows - Nelson's and Saltmarsh - all in all, a very pleasant experience and well worth the drive from Western Mass. This shot, and the one below, were taken with a Panasonic Lumix FZ 40 - one of the so called 'super-zoom' cameras. Here the Little Egret is the right most bird in both shots, with Snowy Egrets and a Glossy Ibis further left. Even on these distant 'grainy' images the extended nape plumes stand out as a key feature.